Howard tells All Things Considered host Noah Adams that the real Johnny Appleseed wasn’t much like the slight and sluggish Disney cartoon version. Near sunset, one day in mid-March 1845, a seventy-year-old man named John Chapman appeared at the door of a cabin along the banks of the St. Joseph River, a few miles north of Fort Wayne, Indiana. Barefoot, dressed in coarse pantaloons and a coffee sack with holes cut out for his head and arms, Chapman had walked fifteen miles that day through mixed snow and rain to repair a bramble fence that protected one of his orchards. Now, he sought a roof over his head at the home of William Worth and his family—a request readily granted. Chapman had stayed with the Worths before on those few occasions when he felt a need to be out of the weather, a little more than five weeks in all over the previous five-plus years. One version of events has him reciting the Beatitudes, from the Gospel According to St. Matthew: “Blessed are the poor in spirit, for theirs is the kingdom of heaven. Blessed are they who mourn, for they shall be comforted. Blessed are the meek, for they shall inherit the earth. …” That could be, but for last words—and this was to be his final lucid night on earth—the Beatitudes are almost too perfect, like those morning-glory leaves fluttering in the old gray beard. More likely, Chapman expounded for the gathered Worth family on the “spiritual truths” of the Bible, its hidden codex, a subject for him of inexhaustible fascination. John Chapman slept on the hearth, by the fire, that night. On that everyone agrees. By morning, a fever had “settled on his lungs,” according to one person present, and rendered him incapable of speech. Within days, perhaps hours, he was dead, a victim of “winter plague,” a catch-all diagnosis that dated back to the Middle Ages and included everything from pneumonia and influenza to the cold-weather rampages of the Black Death. Whatever carried him away, Chapman almost certainly did not suffer. The physician who pronounced him dying later said that he had never seen a man so placid in his final passage. Years afterward, Worth family members would describe the corpse as almost glowing with serenity. That’s overblown, of course, but with John Chapman—or Johnny Appleseed, as he eventually became known throughout the Old Northwest—just about everything is. He had paddled into the Ohio wilderness in the opening years of the nineteenth century in two lashed-together canoes, a catamaran of his own design, carrying nothing but a few tools and two sacks stuffed with apple seeds. The land then teemed with danger: wolves, wild boars, and especially black rattlesnakes, known to the pioneers as massasaugas. One of the earliest farmers recorded killing two hundred of them in his first year while clearing a small prairie, roughly one every five yards. Bears, too, were bountiful. In an account of his travels along the Ohio River in 1807–1809, Fortescue Cuming tells of meeting a cattle-and-hog dealer named Buffington, who a few years earlier had killed, along with a partner, 135 black bears in only six weeks—skins had been selling for as much as ten dollars each back then. Yet according to virtually every testimony, Chapman took not a whit of precaution against such wilderness dangers, was heedless of his personal safety, would rather have been bitten by a rattler or mauled by a bear than defend himself against one. This was John Chapman’s world. He was part and parcel of it—adrift on the frontier with men and women at the outer edge of American civilization. Yet he appears to have glided over it all: abided by the vicious and wicked, welcomed even by the Native Americans whose land the settlers were seizing, impervious to isolation, without bodily wants or needs. It’s almost as if he drew sustenance from the landscape itself, or maybe he simply absorbed the wilderness and became it, much as he absorbed the myth of Johnny Appleseed and became that, too, in his own lifetime. What the record tells us is that when Chapman was present in whatever setting—a cabin, a town, a clearing—he was a powerful and unavoidable personality. Like many fundamental loners, though, he also was a master of the disappearing act: here one minute, gone the next. As we’ll see, there’s more than a little reason to doubt whether Sam Houston ever uttered those words, whether he even knew of Chapman or Appleseed. More likely is this traditional eulogy from another much-lauded fighting man, William Tecumseh Sherman: “Johnny Appleseed’s name will never be forgotten. … We will keep his memory green, and future generations of boys and girls will love him as we, who knew him, have learned to love him.” Sherman had been born and raised in Lancaster, Ohio, land that Chapman was still passing through regularly when the Scourge of the South was yet in his teens. Whether we accept the legitimacy of either eulogy, though, the hope they jointly express has been realized, at best, only in part. John Chapman did not slip unnoticed into the afterlife. His life and death were summarized in a four-paragraph obituary in the March 22, 1845, edition of the Fort Wayne Sentinel, a lively account that runs to almost three hundred words. But Chapman lies today effectively forgotten on the cutting-room floor of the national narrative—his name almost as likely to evoke John Lennon’s murderer (Mark David Chapman) as it is to bring to mind the true source of that memory Sherman vowed would be ever green. 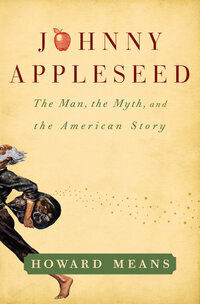 Johnny Appleseed, of course, does live on, but less as a whole person than as a barometer of the ever-shifting American ideal: by turns a pacifist (extolled by at least one and perhaps two of the most renowned fighting men of the nineteenth century), the White Noble Savage (so remembered long after the Red Savages themselves had been driven from the land), a children’s book simpleton, a frontier bootlegger in the fanciful interpretation of Michael Pollan, patron saint of everything from cannabis to evangelical environmentalism and creation care—everything, that is, but the flesh-and-blood man he really was. Excerpted from Johnny Appleseed by Howard Means. Copyright 2011 by Howard Means. Excerpted by permission of Simon & Schuster. All rights reserved.